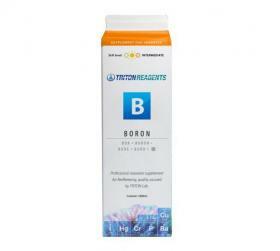 Boron macro element seawater supplement. Boron is an important element that naturally occurs in seawater. Stabilises pH, beneficial for SPS/LPS coral colour and health. When used in conjunction with TRITON Lab ICP testing aquarists are now able to make targeted single element adjustments. Only TRITON delivers advanced aquarium husbandry with ease-of-use. For dosage information please check the DOSE tab of your ICP analysis. The TRITON macro and trace element supplements range is supported by over a decade of scientific research into the chemistry of natural and closed system seawater. With ten’s of thousands of seawater analyses modelled for elemental behaviour and interaction nobody understands seawater like TRITON.